ANIMALS - Español - sachayacu-ev Webseite! 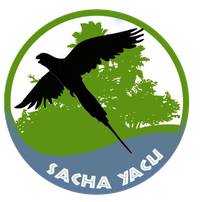 At Sacha Yacu, we receive animals that have been captured by the police from illegal traffickers, rescued from zoos and circuses, taken from abusive domestic situations, and sometimes even discovered hurt in the jungle. We aim to rehabilitate these animals and release them back into the wild if at all possible. Some animals stay with us for a longer time than others, so you will see some changes in the number and variety of animals that we help. For a movie of the whole process which is worth watching, click here. Capuchin monkeys inhabit a large range in Ecuador and much of the rest of Latin America. They vary considerably in size (3 to 9 lbs), and coloring, and can live up to 45 to 55 years in captivity and approximately 35 years in the wild. They can be distinguished primarily by cream or light tan coloring around the face, neck and shoulders, with the rest of the coat typically colored darker than other parts of the body. The face ranges from white to pink in color, and the tail is long, covered in hair, and is partially able to wrap around branches. 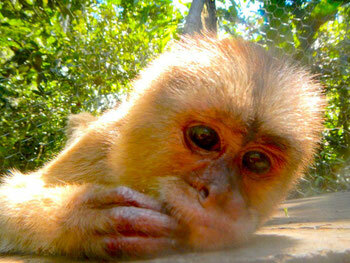 Capuchin monkeys usually live in large groups of about ten to thirty five individuals. The groups can cover a lot of ground in search for food and can jump up to nine feet (three meters) from tree to tree. Capuchins are widely considered among the smartest, human-friendly, and easiest to train. They are even used to help quadriplegics in their daily tasks. Unfortunately, these monkeys have also become a popular pet, and are often used for street entertainment, circuses and other attractions. In Ecuador and other communities throughout Latin America, the Capuchin monkeys are often hunted for their meat or to be sold as pets. 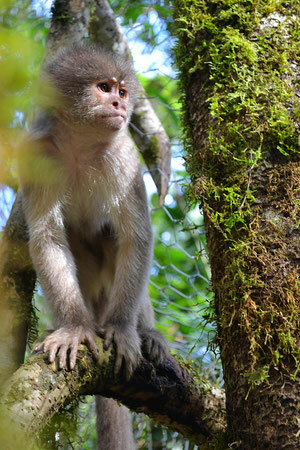 Currently, there are 10 Capuchin monkeys of varying ages at Sacha Yacu. They are mostly former pets and circus animals. Found primarily in South America, the white-tailed titi Monkey can live primarily in lowland tropical and sub-tropical forests. They prefer to be in young forest, bamboo thickets, and swamp edges. They are distinguished by their small size, weighing just one kilogram (apx 2.20 lbs), with a body span of 287 to 390mm, along with a tail that can be one third to one fourth the length of the body and head combined. The tail is not prehensile like with other monkeys, but seems to play a major role in social interactions between mates. A male and female pair intertwine tails at night before going to sleep, and will sometimes do so during the day as well. Red titi monkeys have white fur across the crown of the head, and red fur running along side of the cheeks, chest, belly, and outer arms. The rest of the body varies from grey to orange in color. Red titis are monogamous, and can live with their mates and up to three generations of offspring at any given time. The male is the primarily caregiver, carrying the young from birth to up to four months. Red Titis feed all day, eating mostly fruit in the morning and leaves in the evening, and occasionally insects. They do not interact much with other monkeys and are rarely found in the same trees or territory. They have a complex social life with a variety of physical and vocal signals. Mating pairs perform a duet almost every evening, which can last about five minutes. Other mating pairs in the area reply with their own duets, which helps to determine the boundaries of their territories. Woolly monkeys make their home primarily in the upper canopies of mature tropical forests. They remain at a height of around 12m (38 ft), sometimes coming down as low as 7m (22ft). They are large, strong animals, weighing between 3 and 10 kg. Their head and body ranges from 558 to 686 mm and their prehensile tail is between 600 to 720 mm. Woolly monkeys have short, thick, and dense dark hair. The colors range from dark brown, pale smoky brown, dark gray, pale gray, to red brown. They have round, massive heads with hairless faces, muscular, almost stocky bodies, and a strong tail. They eat primarily ripe fruit, supplemented by leaves, seeds, and insects. Woollies travel, eat and sleep in groups of 10 to 70, sometimes overlapping territories with other families. Females bare one newborn every other year. Lactation continues for about 9-12 months, although they young become more independent after the fifth month. 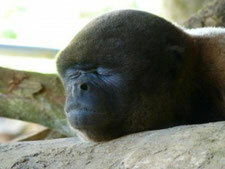 The Woolly monkey is highly prized for its meat and for sale in the pet trade. Due to the extreme hunting of these animals, they are extinct or highly endangered in most areas of South America. 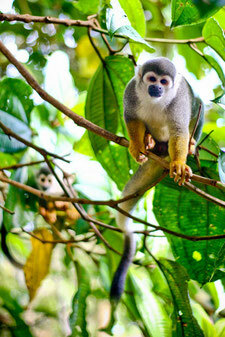 Squirrel monkeys live in the tropical forests of Central and South America in the canopy layer. Squirrel monkey fur is short and close, coloured black at the shoulders and yellowish orange on its back and extremities. Their throats and ears are white, and their mouths are black. The upper parts of their heads are hairy. Squirrel monkeys grow from 25 to 35 cm long, plus a 35 to 42 cm tail. Male squirrel monkeys weigh 750 to 1100 g. Females weigh 500 to 750 g. Both males and females are equipped with long and hairy tails, flat nails, and pointed claws. Female squirrel monkeys have pseudo-penises, which they use to display dominance over smaller monkeys, in much the same way that the male squirrel monkeys display their dominance. Like most of their New World monkey relatives, squirrel monkeys are diurnal and arboreal. Unlike other New World monkeys, their tail is not used for climbing but as a kind of "balancing pole" and also as a tool. Their movements in the branches can be very rapid. Squirrel monkeys live together in multi-male/multi-female groups with up to 500 members. These large groups, however, can occasionally break into smaller troops. The groups have a number of vocal calls, including warning sounds to protect the group from large falcons, which are a natural threat. Their small body size also makes them susceptible to predators such as snakes and felids. For marking territory, squirrel monkeys rub their tail and their skin with their own urine. Squirrel monkeys are omnivores, eating primarily fruits and insects. Occasionally, they also eat seeds, leaves, flowers, buds, nuts, and eggs. Squirrel monkey mating is subject to seasonal influences. Females give birth to young during the rainy season, after a 150- to 170-day gestation. Only the mothers care for the young. 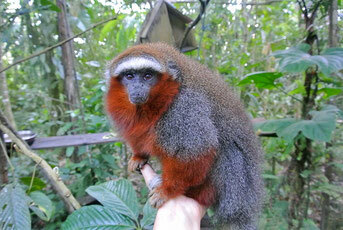 Saimiri oerstedti are weaned by 4 months of age, while S. boliviensis are not fully weaned until 18 months old. Female squirrel monkeys reach sexual maturity at age 2–2.5 years, while males take until age 3.5–4 years. They live to about fifteen years old in the wild, and over twenty years in captivity. Menopause in females probably occurs in the mid-teens. The Tayra are quite common in the neotropical forests of Central and South America at elevations ranging from about 2000 to 2400 meters (apx. 6600 to 7900 feet). 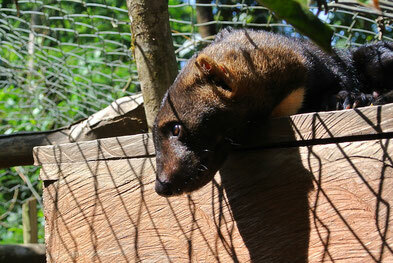 The Tayra have an appearance similar to weasels, and can grow to a size of 60cm, not including a 45cm long tail. Their coloring varies with geographical range, but most Tayra have a dark brown body and a slightly paler head, as depicted above. They can travel both alone and in groups, in tree tops or on the jungle floor, and even in tall grasses. They are expert climbers, jumpers, and swimmers. The Tayra have an omnivorous diet, and prefer small mammals and carrion as well as a wide variety of fruit. These nocturnal “honey bears” are part o the same family as raccoons and coatis, and are an arboreal species with fully prehensile tails, very nimble clawed fingers, and extreme spinal flexibility. They have a thick wooly coat, rounded heads and ears, with large eyes and small muzzles. Kinkajous partake in complex social and mating systems. Their usual home group is typically comprised of two males, a female, and offspring. They have an unusually long gestation and lactation period spanning over 8 months. Just as well, Kinkajous have a relatively long lifespan – between 20 and 40 years. Their primary food source is a variety of fruit. 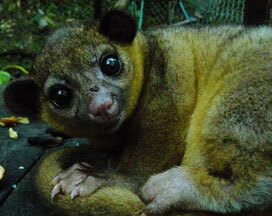 Depending on seasonal availability, Kinkajou also supplement their diet with insects, flowers, and nectar. Kinkajous contribute greatly to the health of forest ecosystems through pollination. Hundreds of these animals are hunted each year for their fur and meat, and just as many are sold into the pet trade. 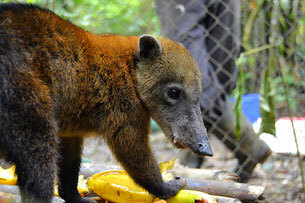 Coatis live primarily in neotropical and subtropical forests. They range from approximately one to two feet in length, have dark brown, gray, or rusted colors on the upper parts of their body, and white on their bellies. They have narrow heads and long, slightly upturned noses. Just as well, they have elongated tails used for balance, and are able to scale trees and jump from branch to branch. They live mainly on the ground, foraging for food with their claws and flexible noses, but have been known to breed and sleep in trees. They appear to be highly social animals, often banding together in large groups of females and offspring (as many as thirty at a time), with one male to the group. Males typically live alone after mating season while females make their nests and go through the 74-77 day gestation period. Coatis typically live only seven or eight years in the wild, although they have been known to live up to seventeen years in captivity. Their diet is omnivorous, consisting of fruits and invertebrates. Peccaries are a tropical species with medium-sized pig-like bodies, a long snout, thick neck, large heads, tiny tails, and very thin legs. Like pigs, their bodies are covered with coarse hair called “pelage”. They are dark brown to black, with white in some areas. 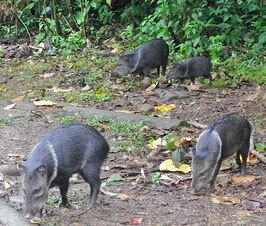 Young peccaries sometimes vary in color from red and brown to black and cream. Peccaries also have hoofed toes – four on the front feet, and three in the back. Both males and females have very large, sharp canines. Peccaries can live in a variety of habitats including desert scrubs, woodlands ,and of course rainforests. They are active both day and night but are primarily nocturnal, constantly moving in search of food and water. With females predominating the herds, the group sizes can range from 5 to upwards of 200 members. Their diet consists of a wide variety of vegetables, seeds, insects, and worms, and occasionally invertebrates and carrion. They have an average of two offspring and live about 13 years in the wild. 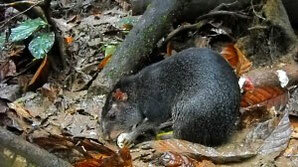 Also known as the “Agouti”, these animals are terrestrial and widespread in the tropics. Their coat ranges from pale orange to various shades of brown, occasionally with faint stripes. Guatusa have very course but glossy hair, short ears , and their hind feet only have three toes with hoof-like claws. The Guatusa are typically found near water along river banks, streams, and lakes. They build their dens in hollow logs, under roots of trees, and in other vegetation. They have an unusual mating ritual where the male sprays urine on the female, which sends her into a “frenzy dance’’ before copulation. The Guatusa mate for life, usually having 1-2 offspring in the wild. The female makes separate dens for her pups of various sizes to accommodate their growth, as well as one for herself. Their diet consists mainly of fruit, sometimes resorting to seeds in off seasons. Guatusa spend a lot of time grooming themselves! Although not very much is known about this tortoise, we can describe the markings as ranging from dark-brown to blackish brown. The scales on the limbs range from yellow to dark reddish orange. Males tend to be larger than females. 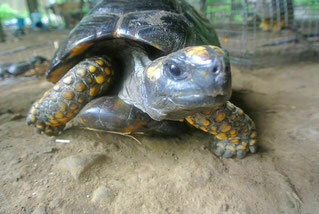 The average length of the red-footed tortoise is 510mm (apx 20.08 in). 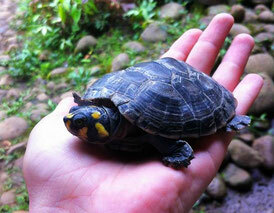 These turtles eat a variety of fruit and vegetables, as well as flowers, fungi, and occasionally carrion. Their life expectancy is unknown, although it has been observed that they sexually mature at the age of five. During mating season, males produce a series of clucking noises that sound much like those made by common chickens. Although tortoises may mate year round, nesting occurs from June through September, and yields egg deposits as small as two and as large as fifteen. The eggs are covered in dirt and require no parental care or supervision. Hatchlings can dig themselves out of the nest, and are immediately independent. The genus Podocnemis is divided into 8 species. All are quite unknown and uncommon in specialty shops, but the best known is Podocnemis unifilis. No subspecies are known. Its shell is black or dark brown in adults, but in young specimens may acquire brown, reddish or greenish tones. Crossing the vertebral shields we can see a small longitudinal keel, although it is the same color as the shell. The plastron is light gray, without spots. The legs are grayish, without spots or streaks. The head is dark with some intense yellow spots. Adult specimens are losing this characteristic. Currently being threatened by poaching. 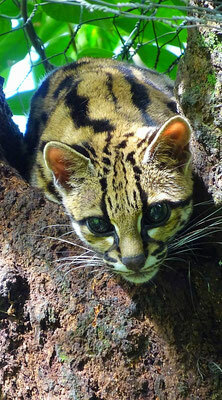 Margays are small, spotted cats that live in the neotropical and sub-tropical forests of South America. Their head and body length are between 463 and 790 mm, with the tail ratio more than half the size of the body. They have tan bodies are covered in dark brown spots in longitudinal rows. Margays hunt mostly in the trees and have a wide range of prey including arboreal mammals, birds, eggs, amphibians, reptiles and fruit. They can reverse their hind-feet to suspend themselves from trees just like the common squirrel. Margays are active during the day and night. The female may breed in the first year, with an average of one to two offspring. Their lifespan in captivity has been marked from 13 to 20 years. The Margay is rare and endangered as thousands of these animals are hunted illegally for their fur. Just as well, the species is vulnerable to habitat destruction. 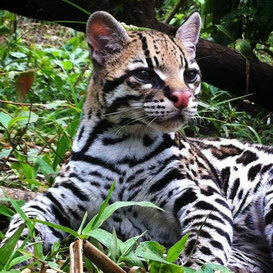 Twice the size of the average house cat, the ocelot is a sleek animal with a gorgeous dappled coat. These largely nocturnal cats use keen sight and hearing to hunt rabbits, rodents, iguanas, fish, and frogs. They also take to the trees and stalk monkeys or birds. Unlike many cats, they do not avoid water and can swim well. The most common macaw found in the Amazon Rainforest, this large parrot inhabits the canopy of the rain forest. Distinguished by their bright feathers, ranging in color from scarlet to yellow and even blue, this bird typically stands at about 89cm tall. Little distinguishes the males from the females, although males may be a bit larger, and have slightly longer tail feathers. Macaws, like other birds, prefer to live in and sleep in large social groups, although they do form life-long monogamous bonds. They share the responsibility for their young with clutch sizes ranging from two to four eggs. The male is the one that typically feeds regurgitated food to the hatchlings. Macaws have an approximate lifespan of 40-50 years in the wild, but have been known to live up to 75 years in captivity. Their diet consists mainly of a variety of seeds and fruit. Macaws have many predators (i.e. monkeys, snakes, and other large mammals), and prefer to hide in the canopy. The ranfasas (Ramphastidae), commonly known as toucans, diotedé or diostedé. This family of ranphastida birds of the order of the piciformes is very wide since it houses 6 genera and 42 types of different species of toucans. They are characterized by a very developed peak and bright colors. 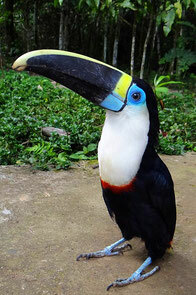 They measure between 18 and 65 cm, being the toucan toucan (Ramphastos toco) of the greater size. They are widely distributed throughout the Americas, from Mexico to Argentina. Some species prefer tropical moist lowland forests, while others inhabit more temperate forests in mountain ranges. 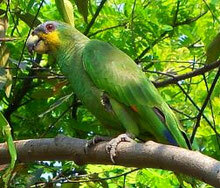 (Amazona amazonica), also known locally as orange-winged parrot and loro guaro, is a large amazon parrot. It is a resident breeding bird in tropical South America, from Colombia, Trinidad and Tabago south to Peru, Bolivia and central brazil. Its habitat is forest and semi-open country. Although common, it is persecuted as an agricultural pest and by capture for the pet trade (over 66,000 captured from 1981 to 1985). It is also hunted as a food source. The head is dark with some intense yellow spots. Adult specimens are losing this characteristic. Currently being threatened by poaching. They are generally quiet otherwise. They are adept climbers and enjoy a myriad of challenges. They are a very adaptable species of bird and are less picky than others about their available food options. They are not the strongest talkers, but are adept whistlers.The white-winged parakeet is 22 cm in length, and is mostly green in color. It has a trailing yellow edge on its folded wings. Its most distinguished characteristic is the white wing patches most noticed when the bird is in flight. The white-winged parakeet feeds mostly on fruit and seeds in its native habitat, and feral populations have adapted to take in blossoms and nectar. 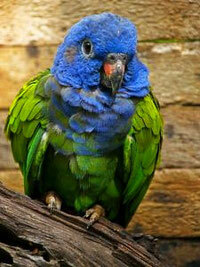 The blue-headed parrot, also known as the blue-headed pionus is a medium large parrot. It is about 27 cm long and they are mainly green with a blue head and neck, and red under tail feathers. It is a resident bird in tropical and subtropical South America and southern Central America, from Costa Rica, Venezuela and Trinidad south to Bolivia and Brazil. It is named for its medium-blue head and neck. Its habitat is forest and semi-open country, including cultivated areas. It is largely restricted to humid or semi-humid regions, but locally extends into drier habitats, at least along rivers. The blue-headed parrot lays three to five white eggs in a tree cavity. Blue-headed parrots are noisy birds and make light, high-pitched squeaking sweenk calls. They eat fruit and seeds, and sometimes grain. They roost communally in palm and other trees, and large numbers can be seen at the roost sites at dawn and dusk. 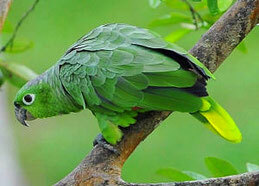 The mealy amazon or mealy parrot is among the largest parrot in the Amazona genus, the amazon parrots. 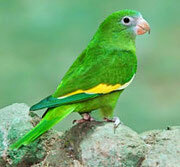 It is a mainly green parrot with a total length of 38–41 cm (15–16 in). It is endemic to tropical Central and South America. 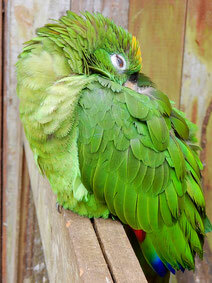 The mealy amazon is social and can be found in pairs or in large flocks. 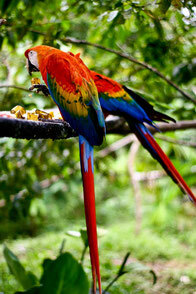 They are even known to interact with other parrots, such as macaws. They are usually quiet but can be loud at dusk and dawn. 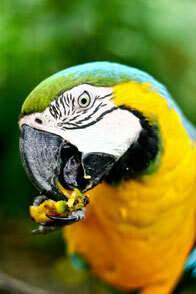 The diet of the mealy amazon consists mostly of fruits, seeds, berries, nuts, blossoms, and leaf buds. They are normally found in pairs or small flocks up to 30, but larger groups may gather at clay licks. Their food includes fruits, nuts, seeds and berries. Foods with sugar and a large amount of salt can be dangerous for them.